Patrick Castle, a senior majoring in biotechnology in the College of Arts and Sciences and goalkeeper on the men’s soccer team, played a total of 39 minutes and 41 seconds in his collegiate soccer career. Season-ending injuries in his sophomore and senior years may have cut short his time on the field but he has never let those injuries define his experience as a student-athlete or the example that he sets for younger student-athletes. 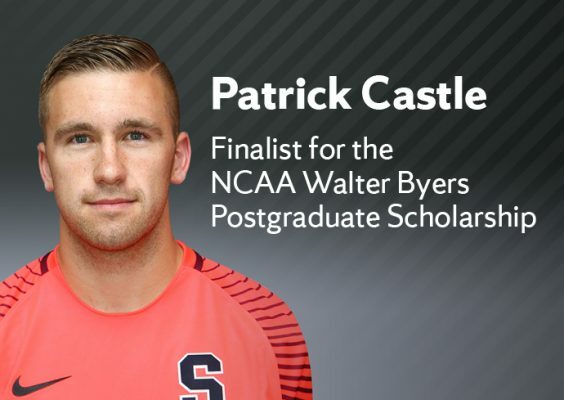 Castle’s time at Syracuse has instead been defined by academic excellence and leadership, and has earned him a spot as a finalist for the National Collegiate Athletic Association (NCAA)’s Walter Byers Postgraduate Scholarship. He is one of just six student-athletes (three men and three women) selected as finalists for the award this year. The NCAA established the Byers Scholarship in 1988 in honor of the contributions of the organization’s former executive director, Walter Byers. The award recognizes excellence in academic performance by student-athletes. Annually, one male and one female student-athlete are awarded a $24,000 scholarship for their outstanding academic achievement and their potential for success in graduate study. Byers Scholars are student-athletes who have combined the best elements of mind and body to achieve national distinction for their achievements, and who promise to be future leaders in their chosen fields. Castle, an aspiring orthopedic surgeon, will interview for the scholarship on Monday, April 30, in Indianapolis. A member of the Renée Crown University Honors Program, Castle is a research assistant in Professor Robert Silver’s cell biology laboratory. “The overarching research question of Dr. Silver’s lab is ‘how do cells make decisions?’ The objectives of my research include gaining education and experience in assessing the biochemistry and physiology of cellular processes with special emphasis on metabolism during cell division,” he says. Castle studies the assessment and characterization of NAD Kinase activity in sea urchin eggs and embryos. He has been awarded Crown funding through the Honors Program, as well as support from the biology department, to pursue his capstone research. He has also worked as a medical assistant in a local orthopedic practice for the past two years. Castle has been on the Dean’s List, ACC Academic Honor Roll and Athletic Director’s Honor Roll throughout his college career and was a Syracuse University Scholar nominee. Last Friday, he was honored during the One University Awards Ceremony as the male student-athlete with the highest grade point average As an athlete, he served as the soccer team representative on the Student-Athlete Advisory Committee (SAAC), including two years as SAAC president. Castle’s student-athlete experience has been complemented by community service during his years at Syracuse. He has volunteered at Upstate University Hospital, and has helped run bone marrow, blood and holiday basket drives. His service in the community has benefited both children and veterans. With children, he has participated in soccer camps at SU and in the local community, read books and participated in the OttoTHON dance marathon, among many other activities. “I would like to thank Jolynn Parker, Mark Trumbo, Professor Robert Silver, Dr. William Montgomery, my soccer coaches, John Wildhack and all of the faculty who have helped me with mock interviews and to prepare for my journey ahead,” he says.